My 4 mo old flyer is ill! We are taking her to the emergency vet, but even though they see exotics not sure if they will see her. She was begging for treats earlier, looking happy. Suddenly when I was going to bed I gave her a clementine, she came out to eat it, but was clearly not herself, looks dehydrated, lethargic and eyes semi closed. She's been eating the clementine the whole trip but very weak. I need help. Also she started to lose fur on her nose but we thought it was molting. I'm so sorry, I don't know what to tell you. Joan will know I'm sure. Just make sure she's drinking and eating what she should, I'll be praying for you both! 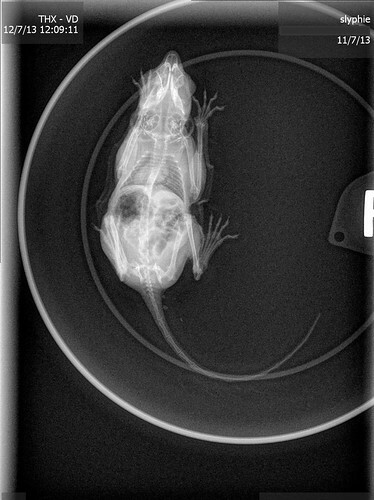 Any vet with rodent experience can help. How is she doing? What did the vet say? I posted a long reply, but when I hit preview, I was logged out for taking too long. If anyone is interested in a long story, I can repost. But on the short size, she had a blockage (which the ER vet missed, so I saw another vet the next day.) You can actually see the issue, but the vet wasn't sure if it was colic or something else (since they are hind-gut fermentors.) Her diet has not been changed (she has Henry's Pet's flyer blocks.) She was on meds for about a week and I switched one of the meds to prune juice a day later. Anyway, with several nuts she has safely stashed in my bra, Sylphina is doing well (has been for weeks). I used to be a vet tech and am now a Master Wildlife rehabilitator, I am really interested in discussing how to get a collective of vet information together on these little ones. It looks like there used to be a lot of meetings and such and I hope these will one day resume. Slyphina almost died since there is a strong lack of information about them in the vet field (for instance, the vet tech mixed medicine that was a 100x overdose, which thankfully I realized so I recalculated the dose..) so if anyone knows of an initiative, I would greatly appreciate any contribution I can have. Hope she continues to do well. Yes, many vets have little knowledge of flyers. Wild life medicine is an elective and most vets prefer to concentrate on household pets. 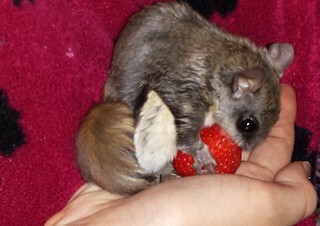 Those with exotic pet experience may know about sugar gliders, but not flyers. Those with rodent experience are the usually the closest we can get. Some vets will call their university vet school for advice, but by in large, wildlife rehabbers with have the most knowledge along with the vets that teach rehabbers.